…and the fundraiser is only in effect for 1 more week. 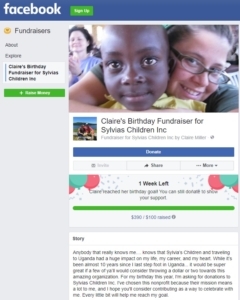 If you are interested in helping Sylvia’s Children, scroll down to the DONATE HERE button. 2) If you love the work we are doing for Sylvia’s Children then tell the world! You have an opportunity to help us make even more of a difference in our community. GreatNonprofits – a review site similar to TripAdvisor – is honoring highly reviewed nonprofits. Won’t you help us raise visibility for our work by posting a review of your experience with us? All reviews will be visible to potential donors and volunteers. It’s easy and only takes 3 minutes! Go to https://greatnonprofits.org/org/sylvias-children to get started!